The Twins | Who are the Twins Selling Real Estate? Patty Blackwelder is a wife and Mom of two grown daughters. Patty is also a confident, competent and accomplish Buyers Agent. 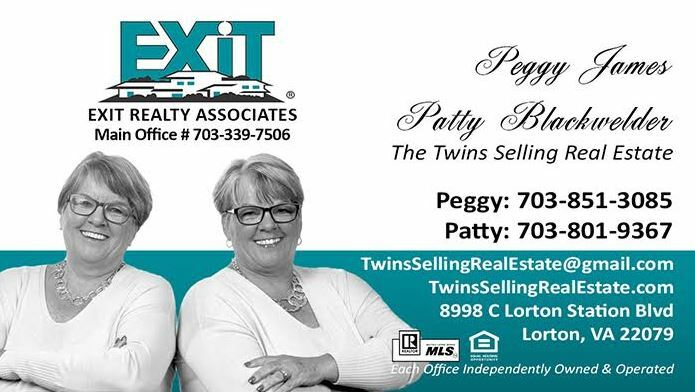 Patty has been in the real estate world for over thirty years. Her passion is New Homes. She loves them. She has worked for three national builders and uses here behind the scenes knowledge to help home buyers wanting to buy a new home succeed. Patty will meet with you, listen to your needs and wants and then help you find the new home community that works perfect for your lifestyle. No matter whether it is your first home, your move-up home or the home you want to downsize to. She works with a home buyers no matter what type of home you are searching for. Give her a call today 703-801-9367. You will be glad she is working on your behalf helping you every step of the way. Peggy James is a wife and Mom of two little people with fur. She has been assisting homeowners sell their homes in the Lake Ridge, Woodbridge and Dumfries Virginia are for decades. Peggy know real estate and primarily works with sellers. She will come meet you, share with you all of the options available to you with regard to selling, the design a marketing plan specific to your home then she will use Social Media outlets to get your home out to the buying public. Call Peggy today at 703-851-3085. We work full time for you, so you can continue to earn your income, pack up your home. Let us if we can be of assistance.